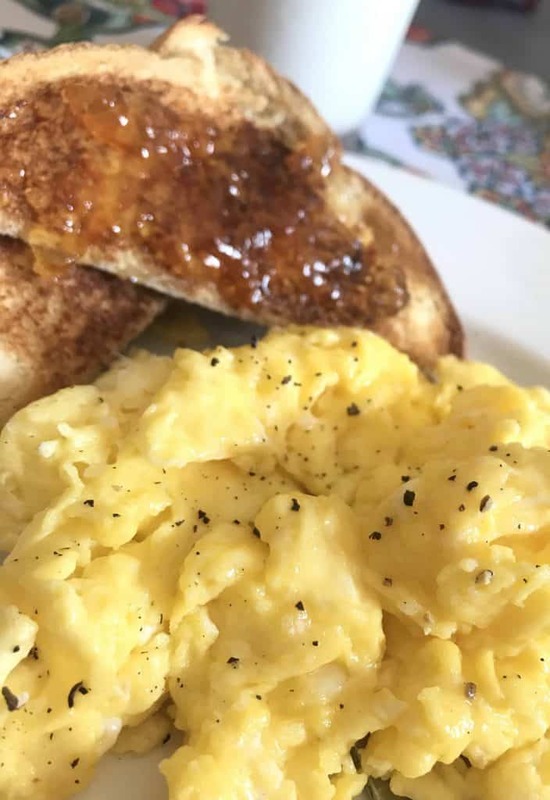 Making perfect scrambled eggs doesn’t require a lot of fancy ingredients or tools…just technique. Even the most experienced cooks have been known to screw up a plate of scrambled eggs…it happens. Here, I’ll show you how to master the perfect scrambled eggs every time! Eggs are a complete protein. A complete protein includes all 9 essential amino acids (recall from high school biology that amino acids are the building blocks of protein). Our bodies produce 21 non-essential amino acids; however, there are 9 essential amino acids that must be obtained from food. 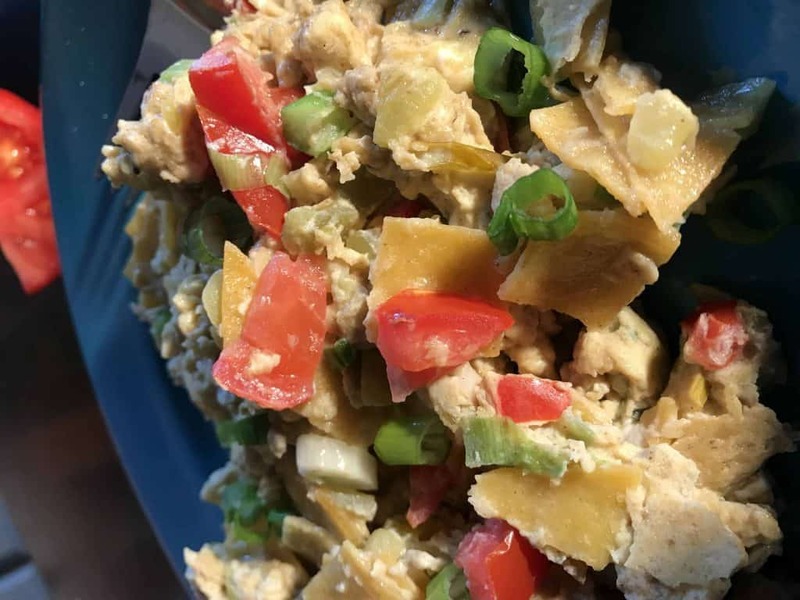 Now, you can obtain these 9 essential amino acids through a variety of foods–complete and incomplete; but, an egg will provide you with all 9 essential amino acids. Other ways to obtain all 9 essential amino acids are to eat complementary proteins, like rice and beans. Alone, rice and beans are incomplete proteins, however, when combined, they form a complete protein. Other complete proteins include spinach, black and garbanzo beans, split peas, potatoes, avocados and quinoa. I use 1/2 tablespoon of butter for every two eggs; just eggs–no milk or seasonings. Heat the butter on medium, beat the eggs, and throw them in the skillet. By the time you’ve taken the bowl to the dishwasher and thrown away the egg shells, you should see a firm, bright yellow circle forming on the outside of the eggs. Turn the heat down a smidgen, and start to stir in a Circle 8. Continue stirring in a Circle 8 format until the eggs begin to coagulate. Lift up the skillet if they start to stick. The entire process should take about two minutes or so. The finished product should have a slight sheen; if your eggs do not appear a tad bit shiny, you’ve overcooked them. 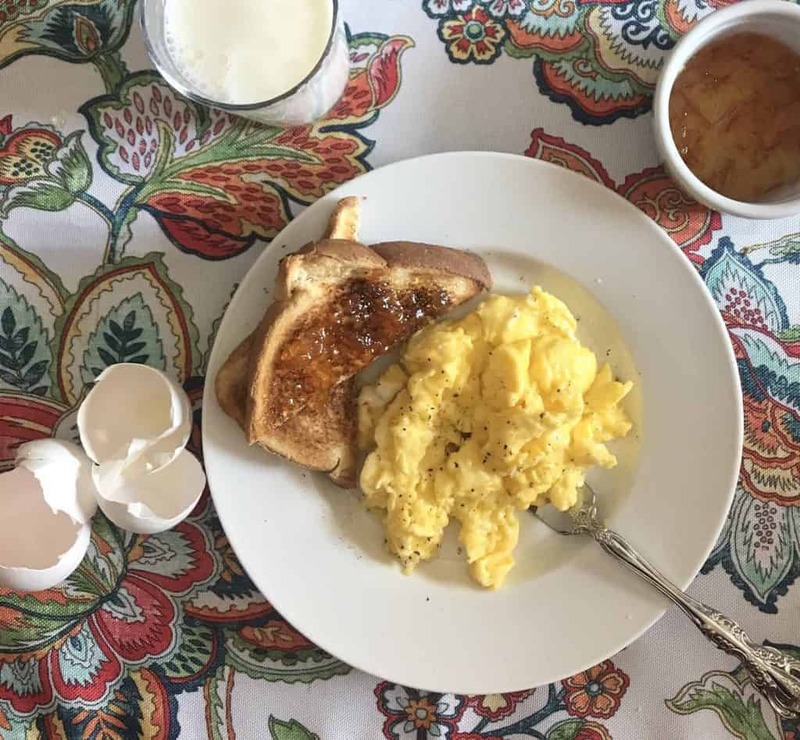 Overcooking results in dry, rubbery eggs because the proteins have shriveled and the moisture in the egg has been overheated either due to high heat or from cooking the eggs too long. This video is not super-edited; I only edited out the melting butter (who wants to watch butter melt?) but the “real time” in cooking the eggs is what you see here. Share this video with your kids and let them start learning how to cook!! 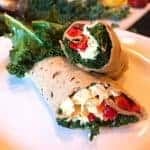 Kale, egg and roasted pepper wrap is uber fast, healthy, and full of vitamins, nutrients, and minerals. 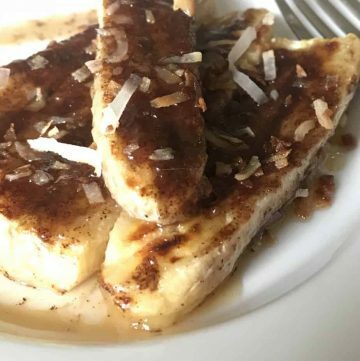 The beauty of this power breakfast is that it will provide you with mega energy and you won’t be starving by 10:00 am. In order to minimize carbohydrates, consider using a low carb tortilla. 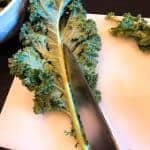 Kale, as with parsley, had previously been treated as the step-child of the dinner plate, resigned to sitting on the edge of the plate as a garnish. But this is not the case any longer. Fortunately, kale has been identified as one of the most nutritionally dense foods on earth. Dr. Joel Fuhrman created a tool for measuring the aggregate nutritional density of a food, called the ANDI score. He ranked the nutrient values of foods based on 34 nutritional parameters, and devised a formula to measure the results. His equation H=N/C (health = nutrition divided by calories) has been since accepted as the norm in nutritional analysis of foods. The ANDI score ranks a food from 1 – 1000 in terms of it’s nutritional density (1 being the worst; 1000 being the best). Kale ranks 1000; soda ranks 1. For comparison, consider other foods’ ANDI scores: salmon, bananas and eggs are all 31; corn is 45; sweet potatoes are 181; cauliflower is 315; romaine is 510 and spinach is 707. One cup of raw, chopped kale provides only 33.5 calories with no sodium, fat, cholesterol or gluten. 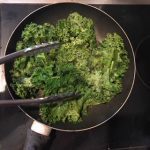 This powerful green serves 684% of the daily value of Vitamin K and 206% of the daily value of Vitamin A, which is essential for skin and vision. It also provides 134% of the daily value of Vitamin C. Other nutritional benefits of kale are it’s supply of minerals. Unfortunately, most of us do not monitor our mineral intake as we should. One cup of kale provides 26% manganese, 10% copper and 9% potassium of the daily value. 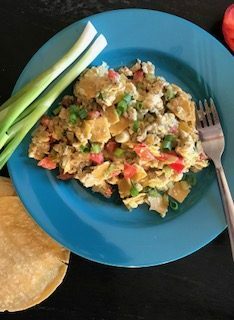 This recipe includes another power-punch of vitamins and minerals from the egg. 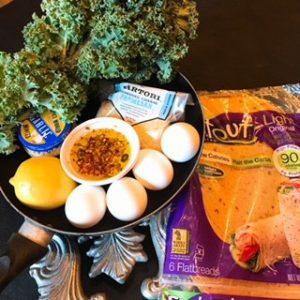 Unfortunately, controversy continues to plague the egg, but recent research indicates that while the majority of the fat and cholesterol are in the yolk, it is the saturated fat, not the dietary cholesterol that impacts HDL. 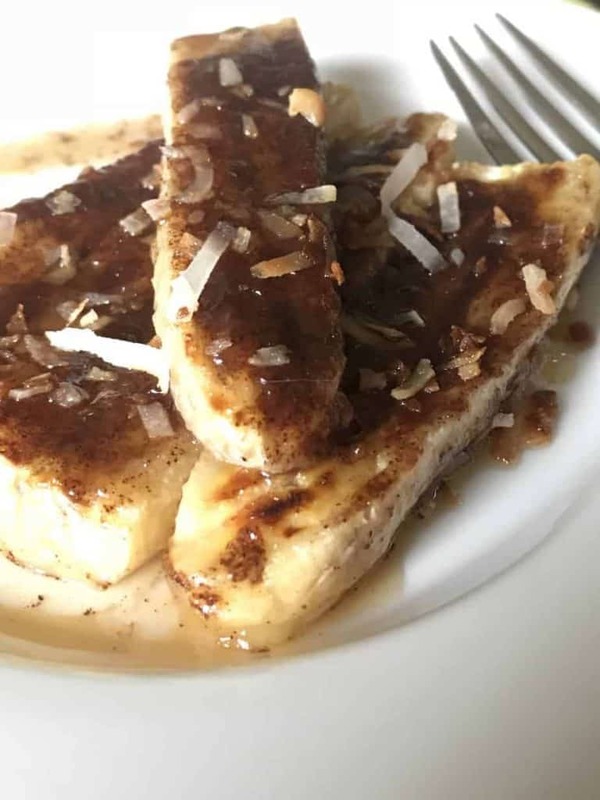 In conclusion, consuming whole eggs, in moderation, is a nutritious way to incorporate thirteen essential vitamins and minerals into the diet, as well as high-quality protein. The difference between a brown and white egg is the hen. Consequently, hens with red feathers and red ear lobes lay brown eggs; white hens with white feathers and white ear lobes lay white eggs. Mystery solved. No matter which grade egg or color is used, the nutritional value remains the same. 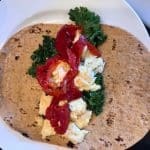 The kale, egg and roasted pepper wrap is quick and easy! 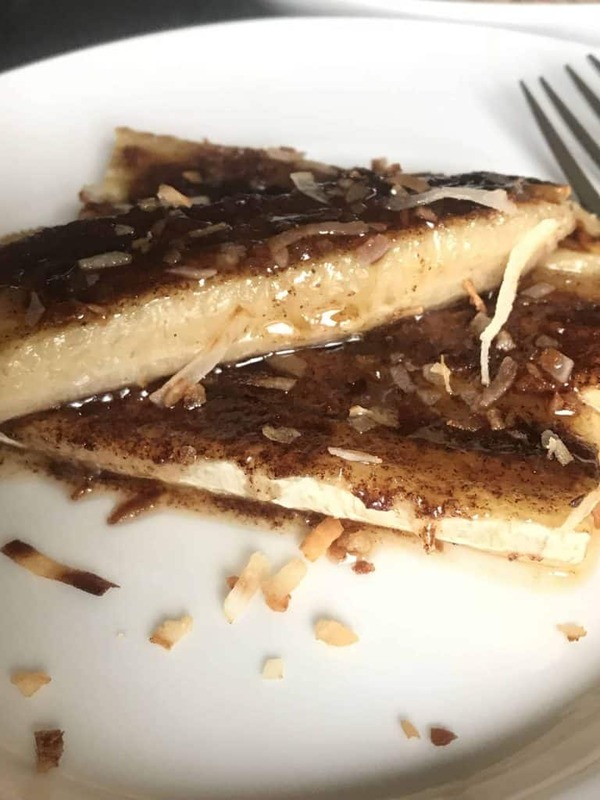 Ideal for mornings “on the go”; cut in half and save the other half for later! See the recipe notes for additional tasty ingredients. Breakfast is the most important meal of the day and this quick, ultra-nutritious kale, egg, roasted pepper wrap will keep you energized all day! Season lightly with salt and pepper; roll-up flatbread/tortilla and enjoy! If time permits, saute onions and mushrooms to enhance nutritional value, or substitute tomatoes for red peppers. On the go? Wrap the wrap in a paper towel and then foil; remove the foil and pop the wrap (covered with paper towel) in the microwave at work!